Here at Three Chatty Cats, we strive to promote and support cat rescues and adoptions by highlighting rescue groups, sharing adoption stories, and showcasing individuals who do their part to help cats in need. So, we want to do our part in supporting this special day, Remember Me Thursday, by continuing to bring attention to shelter cats waiting for their forever homes. Now, let’s learn more about Remember Me Thursday! 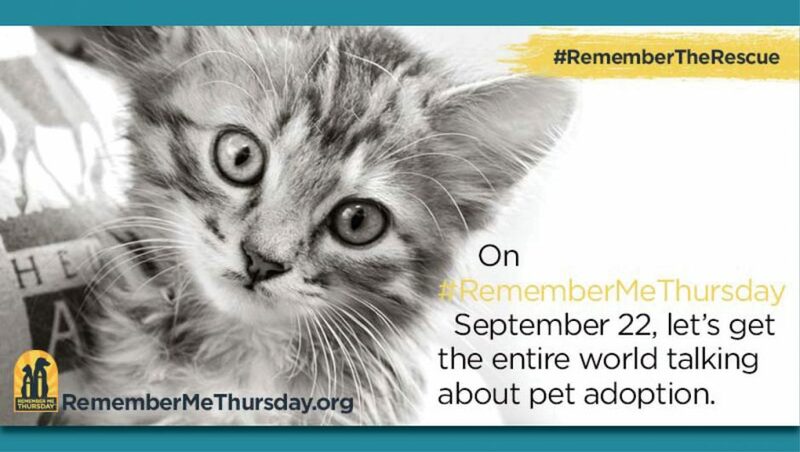 “Remember Me Thursday® is a global awareness campaign uniting individuals and pet adoption organizations around the world as an unstoppable, integrated voice advocating for orphan pets to live in forever homes, not die waiting for them. You can learn more about Remember Me Thursday at RememberMeThursday.org. In 2015, people from 164 countries participated in Remember Me Thursday. Besides adopting a shelter pet, you can let the world know that you support pet adoptions. 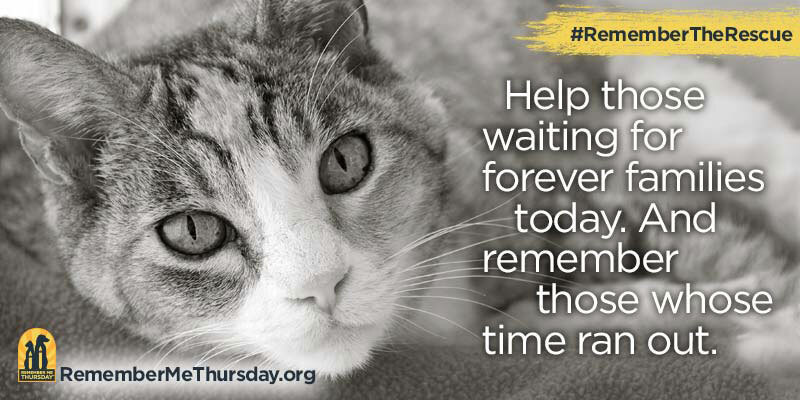 On Thursday, September 22nd, please use hashtags #RememberTheRescue and #RememberMeThursday to get the entire world talking about adopting shelter pets! 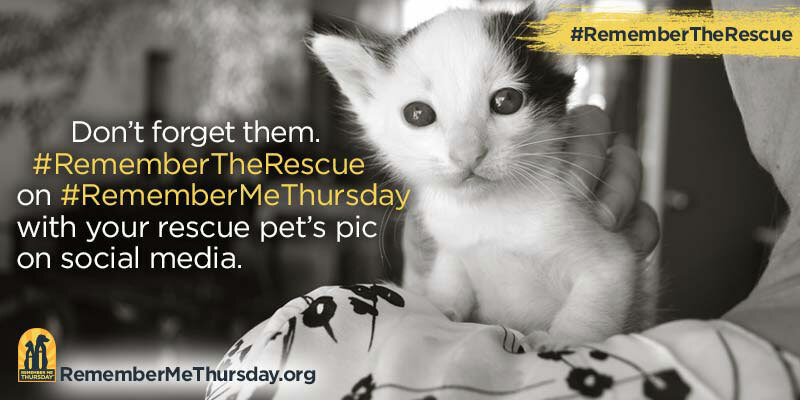 CONTEST: If you use both hashtags #RememberTheRescue and #RememberMeThursday anytime on Twitter or Instagram through September 30th and post a photo of your rescued or adopted pet, you could win $2,000 for your favorite rescue or shelter! Learn more about the contest here. Are you ready to shine a light? Let’s bring awareness to shelter pets and adoptions on September 22nd and get the entire world talking about it. And for those who didn’t make it out of a shelter, let’s remember them on this Remember Me Thursday. A special thank you to Mike Arms, President and CEO of Helen Woodward Animal Center, for creating Remember Me Thursday. Olive is shining a light. She hopes you will, too. Will you be participating on Remember Me Thursday? Really thanks for this, Rachel. Thanks for sharing, wonderful to know about this day and that it has participants worldwide. We participate every year and already have our post done ;) One disappointment, is their video this year has only dogs, NO CATS. We will certainly take part on Thursday! 3 out of the 4 members of the North London Crew are rescue pets and as a volunteer photographer and socialiser in shelters, I know all too well how much education is still needed. Thanks for all the wonderful work you do in highlighting this very important day Rachel! We plan to participate and highlight some of the kitties at the shelter the mom volunteers at. This was my post for Wednesday but you said it so well that maybe I’ll just send people here. MOL! We LOVE this! We will participate! We’ll be participating, for sure! That is a most wonderful day and all the sweeties deserve to be remembered every single day. Thank you for the reminder. We will be sure to participate in this. Thanks for sharing. We weren’t aware of Remember Me Thursday. I didn’t even know about this. Thank you for sharing, I will participate and enter the contest too. I didn’t know about this! Thank you for sharing! Thanks for reminding us of this special day. Mom was late posting ours and getting to visit so belated Meow Like a Pirate Day wishes! It’s so sad when a cat ends its life at a shelter without having a loving forever home again. PAWS has a wonderful new program called the PAWS Pension Plan in which senior cats (over twelve) have no adoption fee and their wellness exam, vaccinations, and yearly blood work will be performed at PAWS for free. There have been some heartwarming adoptions of our senior citizens lately! Thanks for writing about Remember Me Thursday. That sounds like a wonderful program! I love the idea and the mission behind this! Thank you so much for bringing awareness to it! I am looking forward to Thursday. I am sure there will be so many beautiful posts.